Chapter 1: AC Circuit Basics,	Circuit Elements,	Phasors and Equations,	Circuit Simulation. This book may be used by any reader who wishes to learn by example and experiment. Simulation examples are presented which may be done using LTspice, a simulation program available as a free download from Linear Technology. Experiments provided may be performed using a solder-less breadboard, inexpensive parts, oscilloscope, function generator, and a low voltage 3-phase source. All of the Three-phase experiments may be done with a 12 volt peak-to-peak, line to neutral, source capable of supplying up to 125mW per phase. This source may be easily built on a breadboard using the circuit provided in the appendix. This circuit may also be purchased assembled or as a kit from ZAP Studio, LLC. All of the experiments demonstrate basic single-phase and three-phase principles. Analysis suggestions are provided at the end of each experiment. The reader should be familiar with DC circuit analysis and have basic knowledge of AC circuits and phasor algebra. 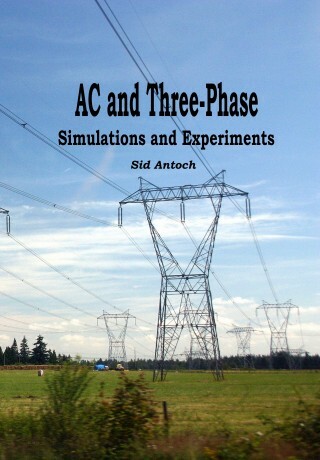 This book may be used as a supplement to an AC circuits course or for independent study.